Our favorite salad in Autumn includes roasted vegetables and crunchy apples with a creamy maple walnut dressing. If the apples you use brown quickly, add them at the last minute. Bake at 400 for 30 - 45 minutes or until beet and yam cubes are tender. Cool on cookie sheet. This can be done the day ahead and refrigerated. Arrange lettuce, spinach, cabbage and red pepper on a large platter. Top with roasted vegetables, apple, seeds and nuts and feta cheese. Place dressing in a small serving jug and serve alongside the salad. Place all ingredients in a blender jar and process until smooth. Refrigerate. Shake well just before serving. *Dressing will thicken in the refrigerator. If using immediately, cut back apple juice to 2 tablespoons. Add additional juice if necessary for leftover dressing. **Walnuts must be fresh tasting. I buy a large bag and keep it in the freezer. Taste the walnuts before making the dressing to ensure they are fresh tasting. Thank you to everyone who shared your stories of learning to cook on Saturday's Back to Foods Class post. It was so interesting and I think that like many of you, reading those stories took me down my own memory lane. I had a Mom that was willing for me to learn as long as I cleaned up after myself and there were no dishwashers back then. I'm sure I used every measuring cup and every spoon she had. The randomly selected winner is Jane and her comment is pasted below. Jane, please leave your contact info (name, email address and mailing address) in a comment on our Contact Page. It won't be published. Oh what a yummy looking salad. I have some beets on my back stoop right now that I just pulled from the garden - I think roasted beets will be happening here today! Your dressing sounds wonderful and I will surely make this. I'm so happy that Jane won the cookbook for her classroom. They are going to love it as I do! If you cut your apples into a bowl of salt water they will not brown and I have often had them keep for up to a week in a Ziploc in the fridge! Just a note on fresh tasting walnuts........growing up with a walnut tree on our farm, I was always puzzled when people said they didn't like walnuts because they tasted so bitter. Our walnuts tasted very similar to pecans. Then I found out that walnuts have a very short shelf life and many of the walnuts you buy in the store are old and bitter. They really do need to be stored in the freezer to keep their fresh taste! I buy the packaged walnuts at Costco and freeze them in plastic containers to enjoy fresh tasting walnuts all year. This is a fabulous salad...I can vouch for that! I 'borrowed' the recipe from Lovella before it was published and served it to guests a few weeks ago. It was a winner...beautiful to look at and very tasty! 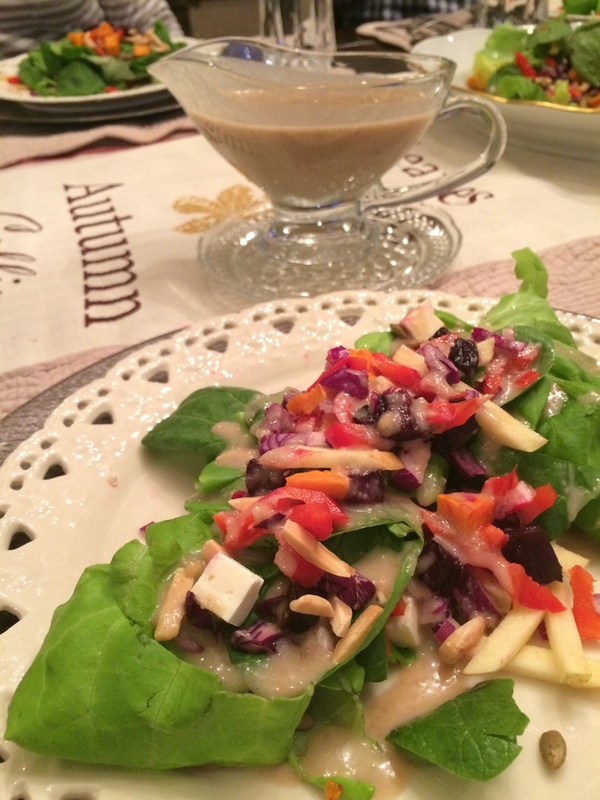 I saw this salad on your Thanksgiving table and really wanted to know more about it! Happy to see it here! I meant - I saw it on a photo of your thanksgiving table! Excellent Vegetable Salad ! I'm so happy that Jane won the cookbook for her classroom. They are going to love it as I do!